17 p. : ill. ; 26 cm. process disclosed in this report may not infringe privately-owned rights. processt disclosed in this report. Date D~eclassified: August 17l, 1955.
abmilar con~tent and title by the same autho~re. make use of the existing~ facilities for handling contaminated liquids or gases. Work performed under Contract No. W-7405-Eng-36. 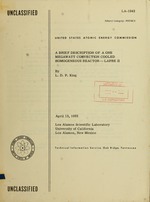 Alamos Power Reactor Program with important information. before such solutions can have any practical value as a reactor fuel. mo~re or less contiaosly for an extended period unless obvious faults develop. to attendance except for startup or during changes to. running conditions. of the tank and plug are at ground level. approximate filling of 95) at the operating temperature of 4300C. tion cooled power package reactor. plated with Ag and Au. 21 ft of 5/16 in. O.D. x 1/8 in. secondary heat exchanger also underground. thermarl average 1.2 x 10'" n/cm"/sec. This assumes 68)6 of LAPRE I fluxee. operating temperatures, by gas pressures less than 1000 psi. 0.010 in, thick will be used. exceed 100oC temperatures and can therefore be made of copper or stainless steel. contaminated disposal system available at TA-55. cut from a single piece. rate of coolant flow in the secondary loop. tor shim sleeve. The outer tank will be gas tight and filled with nitrogen. charged into the reservoir tank. Solution is then added to the reservoir tank through the filling tube. into the reactor tank at a rate which would exceed a reactivity change of 10//0*0.
ature, the uranium concentration of the solution can be changed. the floymeter will permit output power calculation. tor will be in attendance except for occasional routine checks. 1. Rupture of the reactor vessel. 2. Rupture of a heat exchaniger tube during operation. 3. Flooding of the reactor enclosure tan. 5. Failure of a large portion of the vessel. protective cladding. shim insertion, or full power demad from zero level. 7. Overheating of reservoir tank from fission product heat source. 8. Failure of coolant pump in primary or secondary loop. than 200 psi, no appreciable pressure rise should be produced. voir even for connecting pipes as large as 1 in. I.D. The choice of al e m I.D. line is considered to offer no hazard in this respect. exposed surface vae dbtaine for stainless steel. adjustment rates were arbitrarily limited to one-tenth of this, i.e., 10 /sec. degrees for such a burst. therefore, rise to dangerous values when the fuel is dumped. pressure will dischrarge fuel into the reservoir until equilibrium is reached. some fashion or other, they can produce an overpressure in the reactor vessel. in the reactor vessel cannot continue to rise. P. J. Bendt, R. M1. Kiehn, J. R. Phillips, R. M. Bidwell.